The last review was a year ago ... has none of us read a country music themed book in all that time? I've got a big thick biography of Bob Wills but can't find the time to read (or the strength: the thing's like a fuffing brick!! I read loads, but mostly not music books. Having said that, I am currently reading Bruce Springsteen's autobiography "Born To Run". Not country, of course, but many of his songs have been covered by country artistes. I'm about a third of the way through the book. So far I'd say- not bad, but a tad predictable. The opening bits setting the scene about the area he grew up in, his family and so on is quite interesting and well written. Once he gets into adolescence and writes about the birth of Rock & Roll is an overblown, overexcited way, it begins to read like numerous abour autobiographies by artistes of his generation. Likewise his accounts of his early adventures in bands and trying to make a name for himself, reads like just about every other rock memoir you may have read. I look forward to reading the rest but so far out of 5 I would give this only 3. Bruce is a very bright bloke as revealed in interviews and so forth who also has a talent for songwriting, but I found this book so far uninspiring. Once I have finished it, I will review it. I liked Tanya Tucker's autobiography, and often the memoirs by female artistes tend to be more interesting, probably because there are less books about them, and their experiences tend to be more individualistic and unconventional. kev wrote: The last review was a year ago ... has none of us read a country music themed book in all that time? I've got a big thick biography of Bob Wills but can't find the time to read (or the strength: the thing's like a fuffing brick!! Almost a year on and I've STILL got the Bob Wills book to read!! 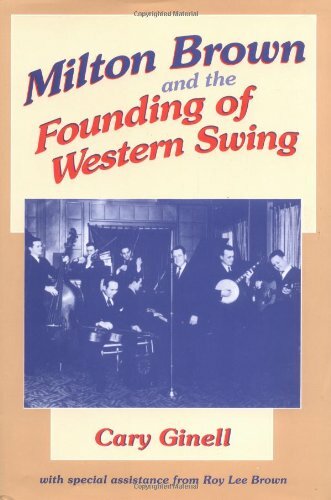 I've also got this one about Milton Brown - seems a bit more readable than the Bob Wills. Got a week off next week, might give it a go! I am a prolific reader, but mostly not of music related books. One I have just finished is "PATSY THE LIFE AND TIMES OF PATSY CLINE" by MAGARET JONES. Certainly well worth a read for anyone interested in this cpountry legend. Some stylistic problems in the writting, but this is made up for by the insights, extensive research & insightful interviews which build up the most compelling picture of Patsy and her life we have seen. A good companion piece would be "HONKY TONK ANGEL-THE INTIMATE STORY OF PATSY CLINE" by ELLIS NASSOUR. This book contains some good photos, too. I'm currently reading Dreamgirl: My Life As A Supreme, the autobiography of Mary Wilson.